AS FORS MW's business concept is to market, develop, manufacture and sell small and medium sized, high quality, customer related products at a competitive price in the areas of agriculture, forestry and construction. Our business concept is that it is better to earn less per sold product and sell more in volume than the other way around. Our business concept is not unique in any way, but those companies that have followed it and kept to it have found it to be a successful model, as indeed it has been for Fors MW. Fors MW never regards a price increase as a simple solution to increased profitability. To keep pace with the business concept, while maintaining improved profitability, we must keep our focus on the best price in all areas, and we expect nothing less of our dealers. Backed by competitive and innovative product programs, known and respected brands, presence on several continents, a strong dealer network with well-developed sales and service channels as well as a focussed and strategic market plan, Fors MW maintains their place as number 1 in Europe. Fors MW has noticeably strengthened their position in the European markets over the last few years, despite poor market conditions. New markets have been opened. The company has moved forward, both in the markets and with its products. The new product portfolio, which was introduced in 2014, played a major part in the success. In addition, strategic and structural changes have been made in the dealer network that have led to strong market channels. Today, Fors MW has a global presence in the market. 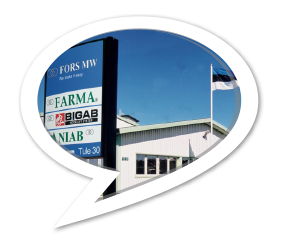 Fors MW brands are strong and trustworthy. The strategy of strengthening the brands is continuous. BIGAB hook lift system is the most sold hook lift trailer in the Nordic area. In 2014, a market survey was carried out on the Swedish market which showed outstanding brand recognition. FARMA forestry trailers are Europe's most sold forestry trailer brand with rapid growth in both existing and new markets, much of it thanks to the biggest product update in the group's history, FARMA Generation 2. Fors MW strives to be the complete partner for our forestry, agricultural and construction customers. A complete partner that supplies all the customer requirements for trailers, cranes and product applications. This makes it easy for our customers - we provide a one-stop shop. A complete partner supplies reliable products and services to customers with the aim of increasing the customers' profitability.